• New environments: If your child is facing nervousness while at the school or at the class, it is obvious to get nervous because of the new environment. To alleviate this, talk with children about what could be the first day at school like. Explain that it is normal to feel a little bit nervous and for this you must give yourself some time. If possible, adjust your routine so that you can give some extra time to the child right after he/she comes back from school. Read Also : How to get admission in top MBA schools? • Failure: Kids mostly worry that they will get too much of a workload at school and it would not be possible for them to maintain this workload. Remind, your child that everyone has to go through this and it is for their betterment. • Encourage the child to make some new friends: Setting up play dates with old friends along with the new ones can aid to lighten up the obstacles which are faced by children in the new environment. With new and old friends around, the child can feel more familiar and keep in touch with everyone as well. • Keep yourself updated with all the information: It is also important to keep yourself in touch with the info about your child in the new environment. Use the options of parental emailing and keep a regular check on the classroom activity log of your child. Stay abreast with the homework and all the activities which are going on at school. Most students are worry about to complete school or college assignments, so you don’t need to worry more because you can get online help with assignment writing companies. • Text anxiety: Most of the kids are also afraid of tests. They begin to worry before time and then they are not able to perform on the day of the test. 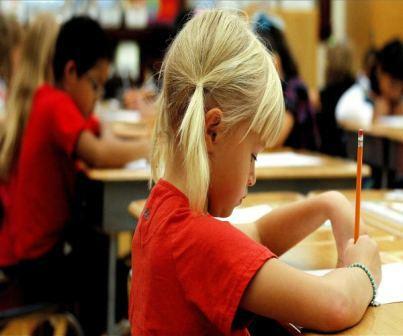 A simple way to provide help to the child is to remind that the information which will be asked on the test is the one which he already knows and you have full confidence that the child will get good marks. • Social fretfulness: Kids always worry about fighting in, having new friends, point of view of others about them, teasing, and being left alone. It is highly important to encourage your child so that he/she can face any situation like this. You have to teach some social skills to your children, which include problem solving skills and teaching them about conflict resolution.